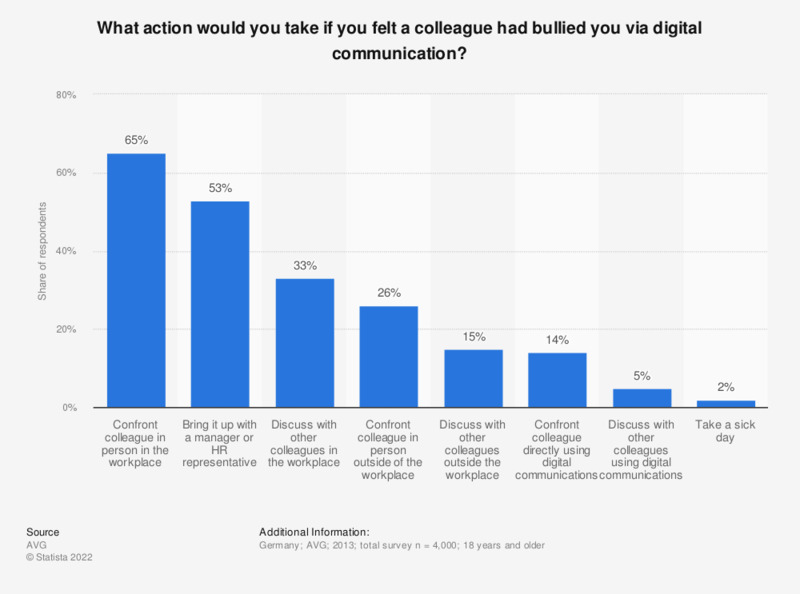 This statistic presents data from a 2013 survey which asked employees what they would do if they felt that a colleague had bullied them via digital communications. According to the survey of adult employees, 65 percent of respondents in Germany would confront the colleague who was bullying them in person at their workplace. Out of the survey of ten countries, Germans were by far the most likely to confront their bully directly. Date of survey is presumed. Multiple answers were possible. Have you ever accepted a colleague's social media request even though you didn't want to? Have you ever experienced the following in the workplace? Would you say social media has eroded privacy in the workplace? Has a manager ever used information against you or a colleague found on a social media site? Have you ever been embarrassed by photos or videos taken at a work event and uploaded onto social media?